Migration is a tough time for birds. Some studies have shown that it is the hardest part of the yearly life cycle for migrants, causing the most mortality. Neotropical migrating birds winter in Central and South America, then migrate to North America for the breeding season. Migration continues throughout the spring season, but if you are out there birding every day you may notice that it happens in waves. Some days the woods are relatively quiet, and other days there are migrants dripping from every branch of every tree and bush. What causes these changes? For decades researchers have been trying to answer this question, and they have found that it mostly relates to weather. Migrating songbirds alternate between migrating at night and stopping over in a habitat along the way to rest and feed. Before they attempt another migratory flight, they will wait for the right weather conditions. As you might expect, these migrants want a tail wind. If the wind is blowing from the north, they will have to fight hard to fly against it, which wastes a lot of energy. If they wait for a windless night or a good wind from the south, flying will be much easier. 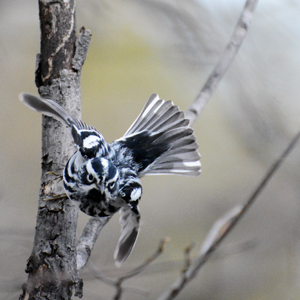 Many birds wait for the right conditions, and will ride a warm front with winds from the south. But a cold weather front from the north may collide with the warm front from the south, creating bad weather conditions such as rain or sleet. If this happens during a large migratory flight, thousands of birds will fall out of the sky and seek shelter immediately, often in the middle of the night. This is where the term “fallout” comes from. With the right conditions — a large migratory flight and a bad weather event — migratory fallout can create an amazing birding opportunity. Birds are seen in strange habitats, such as desert islands and city parks, because they didn’t have a choice of where to put down when the bad weather hit. Many birds are weak and focused solely on feeding, and don’t seem to care if you get close to them. Large concentrations of birds will accumulate in forest patches in urban areas as they compete for food and space in an area where habitat is limited. It’s a stressful time for birds, but when the next warm front sweeps north many will continue the northward migration. In the meantime, fallout conditions create some of the best birding opportunities you will ever see. Watch weather conditions and keep an eye on local birding messaging boards. Many states maintain Facebook groups and listservs where birders discuss the possibility of a fallout event. Birdingonthe.net is a good website to look for your local birding message board. Of course, you can just go birding every day! It’s fun to see the ebb and flow of migration and at some point you might see an amazing fallout event.